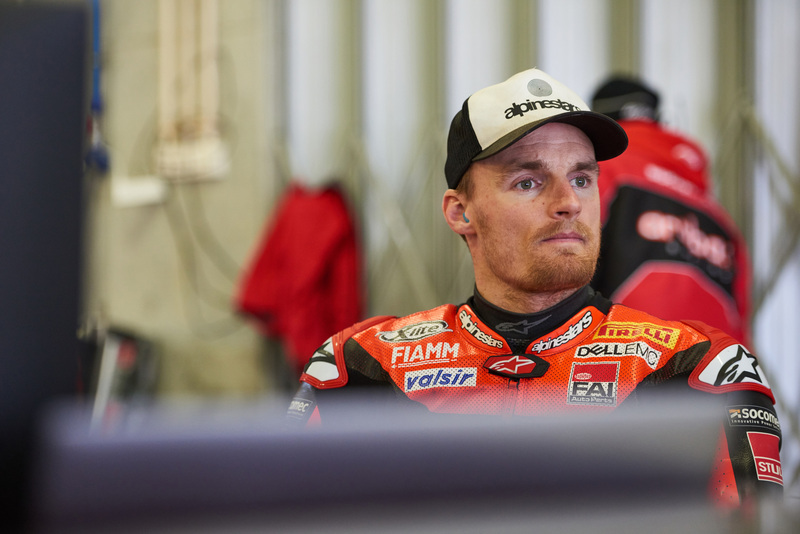 Chaz Davies admitted his final European test ahead of the new World Superbikes campaign was testing in more ways than one. The Powys rider was hampered by a back problem during the two-day test at Portimao in Portugal. Davies has issues with the twinge in his back in last week’s test at Jerez in Spain where he suffered a crash. “It’s been a couple of testing days in more ways than one,” said Davies, who clocked a best time of 1:43.361 on his Aruba.it Racing Ducati bike. “Physically I’m not really recovered from the twinge in the back I picked up in the Jerez test, so it hasn’t been the most comfortable time for me. “On the flip side I’m very happy to have finished the test because I didn’t think it was going to be possible, but I did some good physio between the tests that allowed me to lap. “Portimão is really important because it’s another track where we need to find a good base set-up for the V4 R, while I try and get fully acquainted with the bike. Chaz Davies in action in Portugal. Davies had surgery during the winetr on a shoulder he bust twice last year in a bid to be fully fit for the forthcoming season. The 31-year-old will officially unveil his new Panigale V4 R bike at the team’s presentation in Italy on February 4th. Davies will then head to Australia for the final official test before the season gets underway at Phillip Island near Melbourne next month. The three-time Championship runner-up hopes the bike will allow him to end Jonathan Rea’s four-year reign as champion.